This 21-acre oceanfront property is located on the western side of O’ahu. At this resort, guests can enjoy an over 1,000-foot lazy river and a 18,000-square-foot spa. Disney Imagineering worked with local architects and cultural experts to offer a resort rich in Hawaiian customs and traditions. Aulani also has Aunty's Beach House kids club, movies under the stars, pools for all ages and Disney character experiences. In 2016, Aulani was named #1 Best Hotel or Resort for Families by Reader's Choice - Hawai'i Magazine. For more information, please see Guide to Aulani, a Disney Resort & Spa. 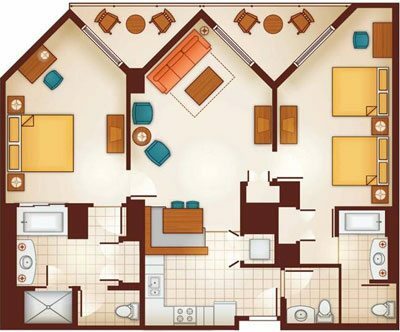 Deluxe Studio Villas feature a queen size bed and queen-size sleeper sofa. Features a master suite with king-size bed and a living room with queen-size sleeper sofa and a pull-down bunk-size bed. Features a master suite with king-size bed; a separate bedroom with two queen-size beds; and a living room with queen-size sleeper sofa and one sleeper chair. 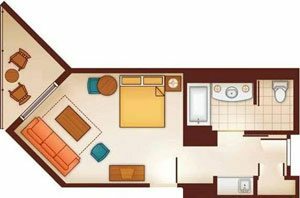 Consist of a connecting One-Bedroom Vacation Home and Studio combination which features a master suite with king-size bed; a separate bedroom with a queen-size bed and a queen-sized sleeper sofa and a living room with queen-size sleeper sofa and one pull-down bunk-sized bed. Features a master suite with king-size bed and two additional bedrooms each with two queen-size beds and private bathroom.